When it comes to planning an elaborate wedding celebration, there is truly no shortage of frustrating and time-consuming scenarios. Between bridesmaid dress fittings, deciding on cake decor and handpicking the perfect flower arrangements, brides and grooms are certainly pulled in several different directions as the big day approaches. And one of the most crucial wedding components – the illusive invitation list – can be one of the most frustrating of all. From choosing who will attend to deciding on seating arrangements, future couples will have their fair share of things to consider when optimizing their perfect guest list. But when it comes to organizing invitations, the cost and complexity of each one should be the least of your worries. With the Wedding Invitation Template for Word from MyExcelTemplates.com, future brides and grooms can send out invites with little cost and without sacrificing style or class. Create a perfectly classic, elegant wedding invite tailored to their individual preferences. 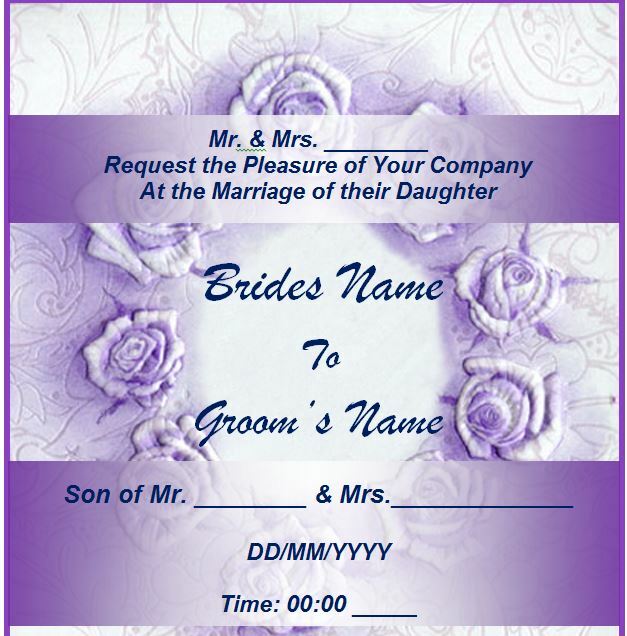 Although the Wedding Invitation Template comes complete with a whimsical purple background and matching font style, the template is completely customizable. Microsoft Word allows users to replace graphics, fonts and styles to fit individual needs. The Wedding Invitation Template can be duplicated several times. One of the major (and most complained about) costs associated with wedding invitations is the overall cost required to duplicate them. 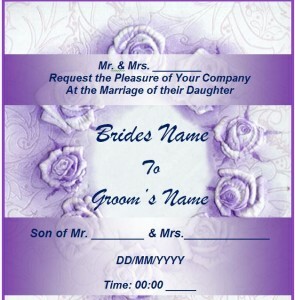 But with the Wedding Invitation Template for Word, the invite can be printed from a high-resolution printer or scanner, making it a highly cost-effective wedding alternative. There’s no arguing the pivotal importance behind crafting a perfect wedding invitation for your future guests. On top of supplying your friends and loved ones with vital RSVP, date and location information, a successful wedding invitation template will help to establish an overall tone and theme for your big day. Have you decided on a particular theme for your wedding? Although it’s not required, establishing a color scheme and overall theme for your wedding can be helpful in designing the perfect wedding invitation template. Are there any particular requirements, or dire information your guests should know before attending? Consider any obstacles that might present a challenge for certain guests, and account for any worst-case scenarios. Send out your wedding invitation template in advance. However, don’t divvy out the invite too far in advance. Make sure the event will be fresh in your guest’s minds as the big day approaches.